Parties for Children aged 5-8 and 9-12. Incorporating mental and physical tasks woven around a narrated theme. Party for 9-12 year olds. The entertainer will arrive costumed as a detective sent to enlist the children’s help to find the missing Idol that has been stolen from the British Museum. 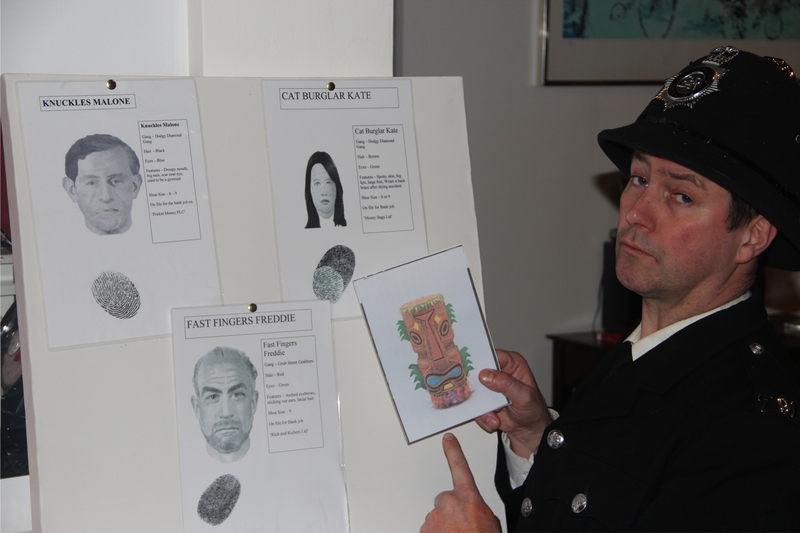 An evidence board is set up with a number of suspects that have to be narrowed down, the children do this by completing various mental and physical tasks such as taking fingerprints, solving riddles, finding clues, invisible ink conundrums, a limbo game (trying to get into the criminals mindset and avoid the lazer alarm)cand other fun games all woven round an interactive story. This ends with a sweet filled Idol piñata. Party for 5-8 year olds. The entertainer will arrive costumed as a fairy messenger sent to enlist the children’s help to find the missing unicorn. The children will be given mental and physical tasks such as solving riddles, finding clues, hook a duck game , making an invisibility bracelet and other fun games all woven round an interactive story. This ends with a sweet filled unicorn piñata. Party for 5-8 year olds.